We were on a scuba diving trip in Fethard-on-Sea, in Wexford. The weather was lousy, the wind was howling and the shore was an impenetrable avalanche of angry ocean. There would be no diving for us that day – we were having the wrong kind of wet weekend. The warm embrace of a local hostelry beckoned us to another variation on the wet weekend theme, but we resisted – at least until afternoon. A snorkel off a beach would pass an hour or two and so we headed for a sheltered shallow shore in the lee of Hook Head. It is almost inevitable when you arrive on some isolated seashore encumbered with the paraphernalia of diving that curious strangers will congregate, suspiciously scrutinising, and someone will invariably ask the same sharp question: “Are yis divers lads?”. This time the onlookers were a few local fishermen, but were not just being inquisitive, they had a request. Apparently they had lost a mooring in the bay some days before and asked if we could have a quick look for it (it’s always a “quick look”). Requests to recover lost moorings and anchors is a common appeal to divers. Everyone who has ever asked has always known exactly where it was and they were usually right – to within half a mile or so! The last thing we wanted to do was search for this mooring but it was as good a reason as any to get wet and waste air (scuba diving in a couple of metres of water on a sandy bottom with poor visibility is a heresy to the normally adventurous activity of diving). And so it came to pass that the four of us swam from shore to a point they had loosely indicated beside a moored half-decker boat. There we split into pairs, using the boat as a transit – not exactly textbook search technique but we didn’t mind, we were just getting wet and didn’t have any expectations of discovering the lost anchorage. Myself and Harry started gently along the bottom, visibility about a metre, looking from side to side with no great hopes of finding anything. And then Harry saw a flounder, resting on the sandy bottom, as flounders do. Quick as a flash his big dagger style diving knife was pulled from its sheath and poised menacingly over the unfortunate fish. 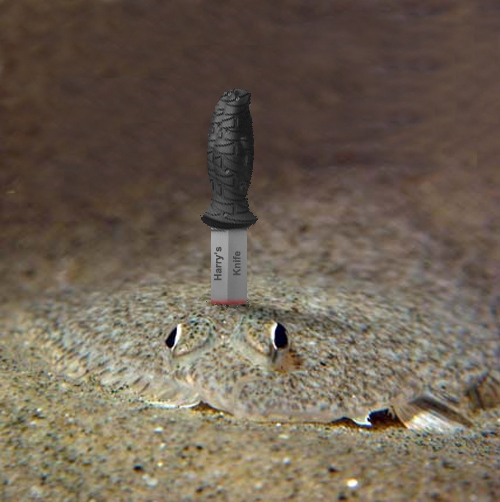 As I wondered if he would be quick enough, the knife plunged downward in a frenzied movement as Harry and the flounder disappeared in a cloud of sand. A few seconds passed, then slowly from the sandy soup I saw a fleeting glimpse of a fish emerging, flapping furiously, the knife standing up in its back like a statue on a plinth, then swimming away like greased lightning into the watery fog. Harry emerged from the cloud empty-handed, staring with incredulous horror at his bare hand, robbed by a lousy flounder! He headed for the surface without further ado. I followed, and we dragged ourselves awkwardly onto the half-decker, no mean feat with a big tank on your back. Harry’s loss was expressed in profanities long and furious and best not repeated. About ten minutes later I was still sympathetically trying not to laugh too heartily when the other pair of divers surfaced some distance away on the other side of the boat. They emerged with the excited chatter of novices, a bit strange for experienced divers on a particularly dull dive. “Look what we found!”, they roared, holding Harry’s knife aloft like Excalibur, complete with the impaled and still flapping flounder. Washed down with creamy pints, it made a grand supper. PS: We never found the missing mooring, but Harry still has his diving knife!